The kit comes with all materials included. You will need an embroidery hoop to fit the project, cotton sewing thread and needles and acrylic paint for those kits that specify it's use. Hi Louise. Sorry for the delay. Just to let you know this is now back in stock. Will you be reintroducing this one for sale again? Hi Katie, sorry for the delay. Just to let you know this is now back in stock. Can you please let me know when the goldwork bumblebee come back into stock. Hi Elaine, sorry for the delay. Just to let you know this is now back in stock. Hi Tasneem, sorry for the delay. Just to let you know this is now back in stock. Hello can you tell me when this gorgeous bumblebee gold kit will be back in stock. When will your beek kit be coming back in stock please. 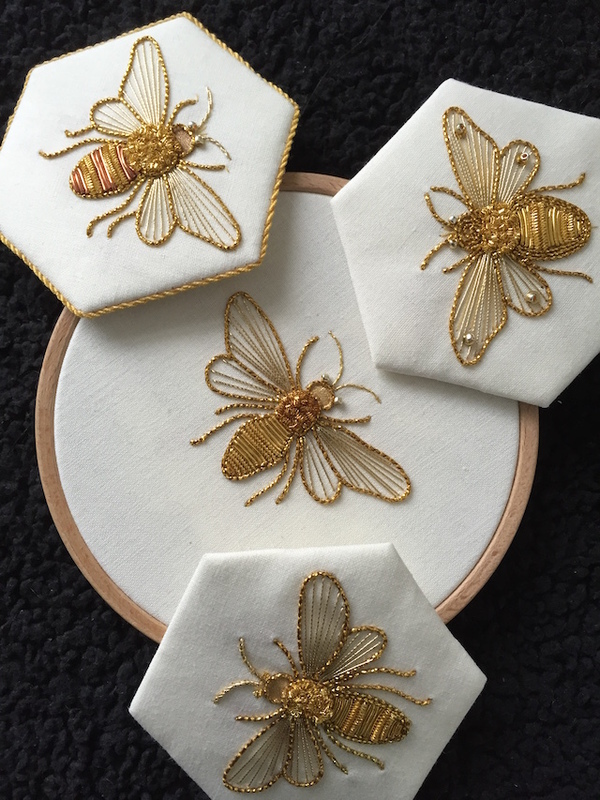 Hi there, I was delighted to find this beautiful bee design on your website and would very much like to purchase a kit, however could you please let me know the size of the finished design as it does not say. Thanks for your enquiry and my appols that you couldn’t find my address. The size of the bee is small but he is lovely to add further embroidery round him. He measures 2 and a half inches wing to wing and 2″ in length. Please let me know when this is back in stock. It’s beautiful (and looks like it sells out often! 😊) Thank you.